Freedom is something I am not feeling today. Sometimes I regret my tenacity. Yesterday, by then end of the day, I could hardly move without writhing in pain. I hope that "pop" we heard was not a rib but a muscle! Freedom from pain would be VERY nice right now. i LOVE the first photo! i hope you will be okay! Great shots. Hope you are feeling better. Oh no!! You are such an active person. I hope the pain is just a temporary thing and nothing too serious. 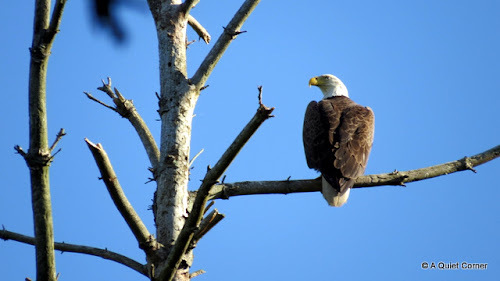 Enjoyed the pictures of the eagle. Love the shot of the eagle. Awesome photo! Hope you feel better soon. Oh, I hope you get better soon. I think I cracked a rib too last time I was in town and bent over the very hard console of the Wrangler to catch something before it hit the floor. Sooo dumb! Please take care and get rest, see a doctor, do whatever is necessary to get well. 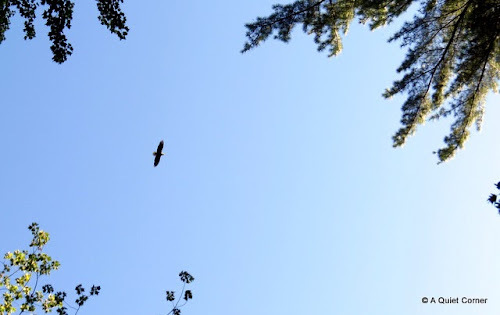 Still though, that eagle is magnificent as it soars free, high above. Pain can certainly bring us down, hope it is fleeting. Here is wishing you can rise above it , and soar like your beautiful eagle friend soon. OUCH...hope that was short-lived and that you are feeling better, JP. And, if not, hope you get some medical advice and slow down and rest as well. It's way too hot to be working a lot now. Of course, we just finished mowing and trimming so I don't follow my own advice very well either. Gosh i hope you feel better! I wish you freedom from pain too. So sorry you are not feeling yourself JP -- maybe slow down a little and rest? I hope this resolves itself soon.